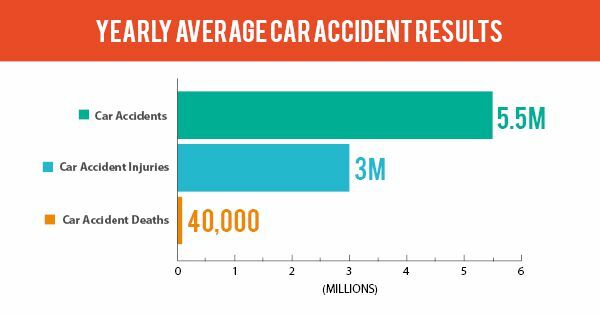 There are an estimated 5.5 million car accidents per year in the United States. According to the National Highway Traffic Safety Administration, these result in more than three million injuries and 40,000 deaths. Car accidents can happen in a number of ways and due to any number of factors, but here are three of the most common and how to avoid them. One of the most common types of car accidents involves one car colliding into the back of another car. This usually happens when the driver who is at fault is not paying attention and does not have enough time to stop or is driving at dangerous speeds. Part of avoiding this is to never drive while distracted, whether it’s using a device (like talking or texting on a cell phone), eating, or grooming. Driving the speed limit should always be a priority and is helpful for avoiding getting into rear-end collisions. Side-impact refers to crashes in which one car collides with another that had the right-of-way, which usually result in “T-bone” crashes. These can be some of the most serious and deadly collisions, because there the sides of a vehicle offer less protection to passengers. The best ways to avoid this type of collision is to drive carefully, safely, and according to traffic laws. Drivers should proceed through intersections carefully, especially after a light has just changed, and should always follow posted speed limits. According to the National Highway Traffic Safety Administration, there were over 60,000 pedestrian injuries as a result of car accidents in 2006. These accidents typically happen in or around pedestrian crossing areas and are often a result of driver inattention, pedestrians not crossing carefully, or decreased visibility. Pedestrians should always look both ways before crossing a street and should use designated walkways whenever they are available. When walking at night, pedestrians should wear reflective clothing and carry or wear lights. Drivers should drive with increased caution near pedestrian crossings and at night. Traffic matters are the number one cause of lawsuits in America, and some of these are personal injury lawsuits. More often than not, when it comes to car accidents, someone was negligent and at fault. Anyone who has been involved in a car accident and suffered a personal injury should make it a priority to find a personal injury lawyer who has experience handling car accident cases.